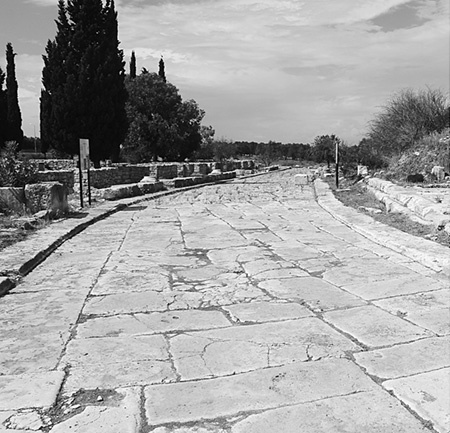 The Sacred Way connecting the city of Miletos to the sanctuary of Didyma has long been considered one of the best-documented examples of a processional road from the ancient world. Views of the road have become ossified around an orthodox reconstruction of the route, which is assumed to have remained relatively static from the Archaic to the Roman period. A reexamination of the full epigraphic and archaeological evidence, incorporating the latest research in the region, highlights the many gaps in our knowledge and the possibility that the route and identity of the Sacred Way may have changed substantially through time. Computational modeling of the local topography confirms the feasibility of alternative routes and the effect that probable long-term landscape change around Panormos might have had. This article calls for a fresh characterization of the Sacred Way from Miletos to Didyma, which envisages multiple periods of (re)invention and (re)construction from the Archaic period right up to the modern day.